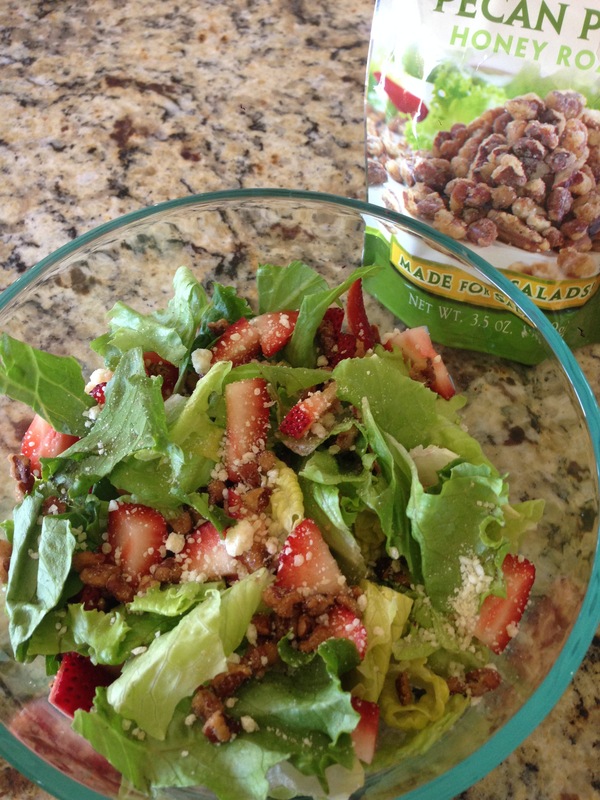 This gorgeous salad is quick and easy, not to mention delicious! I don’t always like to eat “kid food” for lunch, so I’m always looking for something a little more adult I can pull together. I found this pack of honey roasted pecans in the salad dressing isle of my grocery store and wanted to give them a try. And guess what? They were yummy, and the perfect topping for just about any salad! I typically just toss whatever I have on hand in my salads, and I was pleased with this combination. It is light and delicious, and great for moms who don’t have a lot of time on their hands. Tear up the lettuce, then top with the strawberries, nuts, and feta. Drizzle on some balsamic vinaigrette or your favorite dressing, and enjoy a yummy lunch. Optional: add 1 tablespoon Dijon mustard for a little bit of spice. Mix ingredients in a mason jar and shake it until blended well. Store your dressing in the refrigerator for up to 3 weeks. That sounds delicious! Thanks. I’ll have to look for those pecans. Yum! I’ve been on a salad kick lately, and while my husband has jumped on board, he is wayyy less adventurous with his toppings!